“The world is dabbling with something very dangerous right now,” warned John Oliver at the conclusion of his last Last Week Tonight main story of the year on Sunday. No, not our near-universal obsession with Bradley Cooper’s new version of A Star Is Born. Sure, that’s hyperbolic and a little weird, but basically harmless. Instead, Oliver spent the bulk of his final show of 2018 tracing the global rise of authoritarianism. You know, that thing taking hold in a growing number of places like Turkey, Hungary, Poland, Turkmenistan, Brazil, the Philippines, plus good ol’ dictatorships in Russia, North Korea, and China, where people are looking to charismatic, rule-flouting, violence-praising strongmen instead of putting their faith in democracy, or any other system where leaders don’t routinely put out shirtless pinup calendars, lift spindly gold bars while obedient underlings clap in unison, or throw his sick workout videos up on YouTube, bro. Oliver, ever the helpful host that makes you laugh until you stop because you feel queasy and a little afraid, even provided a handy authoritarian checklist. 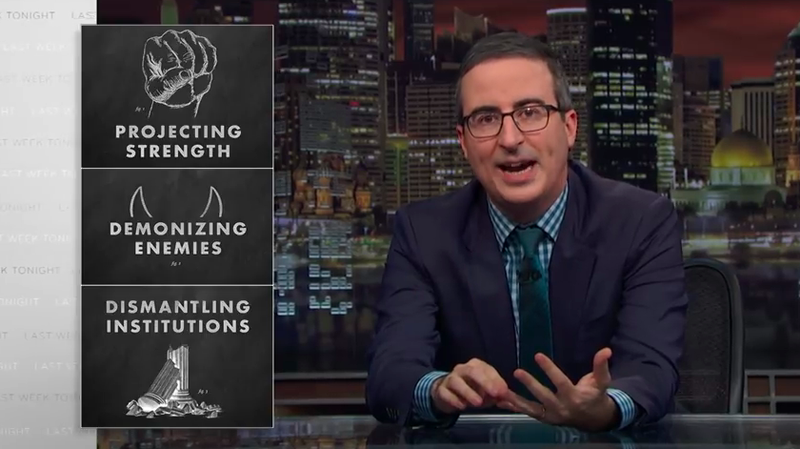 Outlining three of the most common traits of would-be authoritarians, dictators, and guys definitely overcompensating for something weird about their dicks, Oliver ran through them one by one. First up was projecting strength—like, just to pick something out of thin air, demanding a massive, expensive, needless military parade to show the world (and his domestic critics) what a big armed forces he has. Then there’s demonizing enemies, for when the whole “look at my huge missiles and buff dudes with tight haircuts who’ll do anything I say” displays aren’t enough. Kind of like—again, just spitballing—whipping up racist, anti-gay, xenophobic fear among one’s receptively fearful and bigoted base. And then there’s attacking institutions, like a nation’s systems of checks and balances, judiciary, and the free press, either through smearing all those whose jobs involve investigating or curbing the leader’s will, or outright encouraging mob violence against those deemed enemies. Some, it’s speculated, even tell their followers that they will pay the legal fees of anyone who will “knock the crap out of” protestors at one of his propagandistic rallies, although that’s just too cartoonishly villainous for anything but bad dystopian fiction, so let’s move on. But we kid the former reality show narcissist currently appointing an unqualified loyalist (and “well-dressed fire hydrant,” according to Oliver) to transparently curtail a legitimate investigation into whether he conspired with Russia’s own authoritarian despot to put him in power. Oh, no, Oliver is most definitely not, as he points out that the only reason why Donald Trump hasn’t done things like kill the Mueller investigation, end birthright citizenship for immigrants (not willing to marry him for his money), or successfully ban reporters he doesn’t like from the people’s White House, is because he’s been stopped by American institutions (the vote, congress, the judiciary) still managing to hold him back. As Oliver says after a montage of Trump loyalists who sound exactly like the Filipina angry that people are focusing on Rodrigo Duterte’s extrajudicial murder spree rather than how much work he’s done on the country’s infrastructure, he gets it.